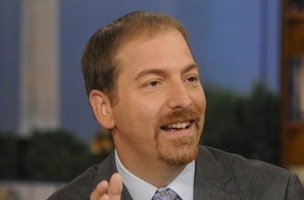 In his first year at Meet the Press, Chuck Todd has made the program his own. Sunday marked Todd’s one year anniversary with the NBC show, the longest running show on television, and where he was joined by Gen. Colin Powell, Richard Trumka, Doris Kearns-Goodwin, Tom Brokaw, and Hugh Hewitt. Since he began at Meet the Press last year, Todd has really added his own touch to the program; there is a new set, there are new segments, and on Sunday actor Dennis Haysbert began lending his voice to the program. This week, Meet the Press was the most-watched Sunday show.